On the 15th September 2018 I was very fortunate to be invited to attend a remarkable table-tipping seance with the Mediumship of Kai and Julia Muegge and his remarkable spirit team at Parsonage Side Retreat in the United Kingdom. Very strict pre-seance checks were performed by independent assessors who searched the entire room and all attendees. Before long the 17 sitters braced themselves for an experience we will all remember for the rest of our lives. ‘Table-turning’ (also ‘table-tipping’, table levitation’) refers to the anomalous movement of tables and other furniture, one of several séance effects widely-experienced throughout the developed world from the middle of the nineteenth century. The phenomenon is thought to occur from the psychic energy of a group, not necessarily with a medium present, although it has also been widely regarded as a medium of spirit communication. 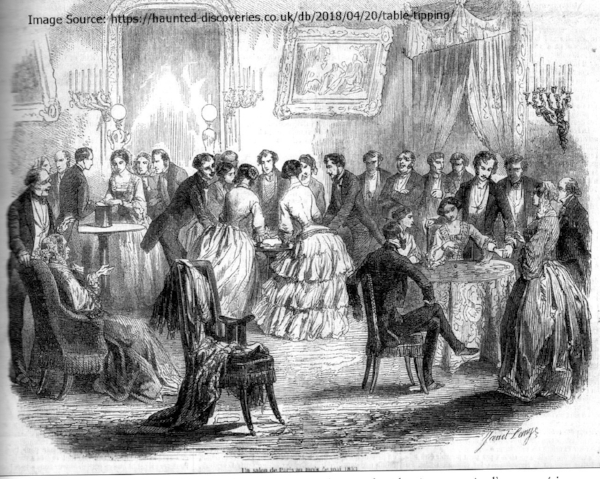 The table-turning seance included 2 rows of sitters with 8 in the first circle and 9 in the second group. The medium sat at the end of the table and commenced with a talk from Kai demonstrating how many mediums of the past had faked table phenomena and validated how he had no such devices. His hand on the table in the same manner as all present with sitters close by to observe in great detail. His spirit team were very present and as he summoned them I saw him looking toward the ceiling with a smile on his face and to me it looked as though he acknowledged the presence of 3 to 5 spirit forms who were working very hard to produce the phenomena. All the sitters began singing to raise the energy for the spirit team to work with and before long the table began to wobble. The momentum continued with subtle movements before the table commenced to rotate quite rapidly to every ones delight. But no one was prepared for what took place next as the table lifted high into the air; setting a very high anticipation for what will follow! I was seated in the 2nd row initially however it was now our turn to swap seats with the 1st row and place our hands on the table. The energy flowing through the table was so powerful and beautiful and with much anticipation the table very quickly regained its rotating demonstration but this time very powerfully; almost like a rotary engine. We all laughed with such joy that is until all of a sudden we heard a very loud bang in the center of the table. I nearly leaped out of my body as the noise took me off guard! Kai requested Julia to turn on the red light where all were amazed to discover a smaller table sitting on top of table. This smaller table was positioned outside the circle toward the back of the room near the seance cabinet. The table was levitated over our heads and dropped perfectly into the center of our main table. When this took place all sitters in the back row were holding hands with those beside them to ensure all were accounted for. The spirit team next cued the medium for the teams to now swap places and the 1st row to return to the table. As our singing again lifted the energy the table resumed a steady spin before the team in spirit focused their efforts on producing light phenomena across the table. Flashes of light were seen by both rows of sitters close to the table much to our delight! At this same time the spirit team began to levitate objects from near the cabinet as they raised up into the air. The chime of the tamborine pulled out eyes in that direction as it danced in mid air and fell back to the ground once again. The energy in the room was electric and everyone was having such a wonderful time and before long it was our turn to once again return to the table. As before the energy very powerful with the moving so rapidly that it blew my mind. Once again near the seance cabinet objects were seen lifting up into the air well up over our head very close to the ceiling. We all thought it was just the tamborine as it very gently lowered down and sat on the table with virtually no sound other than the tamborine chime! This part of the demonstrations too place in the dark however the tamborine did have a glow in the dark point on its surface. You can imagine our complete shock as the lights returned and the tamborine was in the legs of a much larger and very heavy timber table atop our seance table! My jaw dropped in sheer amazement! Next the medium called all sitters to join the table and hold our hands as the medium asked all sitters to imagine a large drop of water trying very hard to fall from the ceiling onto the table. We tried multiple times until he instructed us all to gently squeeze the hands of those either side of us as we really focus now and right at the moment a magical apport magically falls from thin air onto the table in red light for all to see! A gift from the spirit world to our wonderful hosts at Parsonage Side Retreat. The item, a small statue featuring Ganesh with his father Shiva and mother Parvati.